Maintenance and service costs for the wind turbine are lower (fewer wearing parts, no gear oil change, etc.) and operating costs are reduced. The rotor hub and annular generator are directly connected to each other, as a fixed unit without gears. The rotor unit is mounted on a fixed axle, called axle pin. Compared to conventional geared systems that have a large number of bearing points in a moving drive train, our drive system has only two slow-moving roller bearings. The reason for this is the low speed of the direct drive. 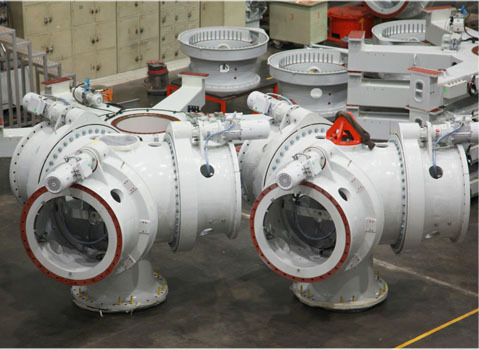 The generator is directly coupled with the turbine rotor rigid; couplings are avoided and hence bearings are used. We carry out advanced development of cast components, in close collaboration with the foundries. All cast components are drawn on a 3D CAD system and calculated using the Finite Element Method to test strain increases at critical points. During the entire prototype phase, the designer tests and optimizes performance. Cast components are not released for further steps in the manufacturing process, until comprehensive quality testing has taken place, thus guaranteeing high quality standards in the cast component supply chain.